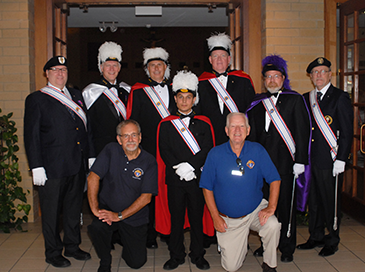 The Knights of Columbus are a million-plus international Catholic fraternal organization. We are based in the U.S. but have councils in Canada, Mexico, the Philippines, and Europe. For more information, go to www.kofc.org. The St. Maximilian Kolbe Council #11355 is the council for the St. Maximilian Kolbe Parish. We have more than 150 members and do a wide variety of charitable works in the parish and community. Our meetings are the 3rd Monday of every month in the Large Conference Room at St. Maximilian Kolbe Parish. The meetings start at 7:00 PM and there is a Rosary before the meeting starting around 6:30 PM. If you are a Catholic male, 18 years or older, please consider joining. Vivat Jesus!